There aren’t many “Best TEAS Study Guides” lists out there. So we put one together. There are plenty of study guides out there but they’re not all useful. We’ve picked our favorites and wrote a brief summary about what makes each great. Your TEAS score is important. There’s no way around this nursing school requirement. But don’t panic. With the right preparation you can approach the exam with confidence. But because you’ll be spending a good amount of time studying it’s critical you get the right advice. As a quick overview, below is our list of the best TEAS study guides. For more information, scroll below. Assessment Technologies administrates the TEAS test. Having them publish this book makes it the official study guide for the TEAS. It’s the most comprehensive review for the test available today. True to its name this is a content review book. There’s review material for all the tested TEAS concepts. Including topics within reading comprehension, mathematics, science, and language. The material’s well written and touches on all the subjects areas well. Just understand this book isn’t designed to review every topic from your science classes. The included practice questions are just like the one’s you’ll see on the actual test. This shouldn’t be a surprise though. As the guide’s put together by the same people who write the test. All thing said, this the best TEAS study guide available today. No preparation is complete without it. Mometrix’s ATI TEAS Secrets Study Guide is a challenging and all encompassing prep book. It includes a study manual for the latest TEAS 6 versioned test. Reviewing critical content material that you need to know. Like human anatomy, scientific reasoning, data interpretation, and reading comprehension. The guide’s laid out in a logical manner. Making progression through the various topics easy to manage. Mometrix also gives access to their online video library. There are 74 video tutorials that cover various topics and questions. It’s a great addition that breaks up the monotony of reading text. Once you’re done reviewing all the material there are three full length practice tests to work on. To sum, the guide offers a well rounded preparation for the TEAS test. It’s a good choice for those looking to get only get one prep book. McGraw-Hill’s TEAS study guide is our second favorite TEAS prep guide. It’s a well-rounded practice book that covers every section of the TEAS. What set this apart from other study guides is the five full length practice tests. They’re excellent for extra practice. The questions don’t quite match the difficulty of the official questions. But there’s a lot of them. And they offer a great practice opportunity. Especially if you’ve been out of school for a while or need more practice. Practice makes perfect – and there’s plenty of practice to be had here. Each test takes about 3.5 hours to complete. If you include reading answer explanations, you have about 20-24 hours of prep. 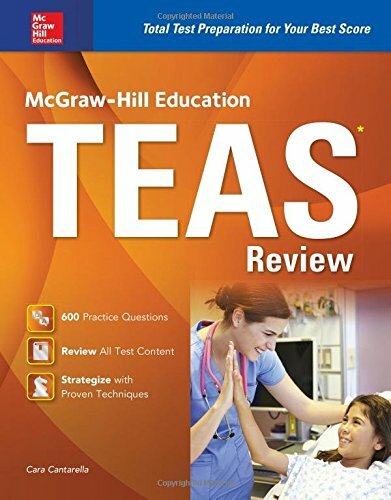 McGraw-Hill’s TEAS Review is a content review book. It focuses on reviewing key subject areas that you’ll need to know to pass the TEAS. There’s thorough coverage on each of the test’s subjects: reading, math, science, and English. After each chapter there are review exercises to work through. In total there are 600 review questions. The review for certain topics is much more detailed than the ATI material guide. In particular, there was more information for critical science sections. Unfortunately, the book like the ATI guide doesn’t cover all science topics. You’ll need to do use some additional reference tools. As the ATI guide has much better practice questions, it’s our preferred pick. But if you’re able to find this at a cheap price, it’s worth grabbing. Kaplan’s High Yield Practice is budget friendly prep option. It offers quality practice questions for a low price. For around ten dollars you get a good amount of practice material. There’s a 170 item diagnostic practice tests with feedback to target weak areas. Access to an online repository with another 50 Qbank style questions. And then another 100 extra practice questions to work on. The questions quality is excellent. On par, if not harder than the actual test questions. There’s some basic content review in the book. But for the most part this book should be used for it’s practice questions. It’s great as a last minute prep practice. Remember using CliffNotes in high school to better understand Shakespeare? Well CliffNotes also offers test prep books. And guess what? Their math review book is amazing. If you think you’re bad with math, pick this up. You’ll learn a great deal of math. The book has dedicated sections to every type of math problem you can encounter. The explanations are easy to understand and the book’s structure is well thought out. There’s also a diagnostic test to help you identify your weakness areas. Math is a big chunk of your TEAS score – it’s the second longest component. If you have trouble, it’s not worth taking the TEAS unprepared. The guide will prepare you and is a great reference for any other future standardized test you may take.